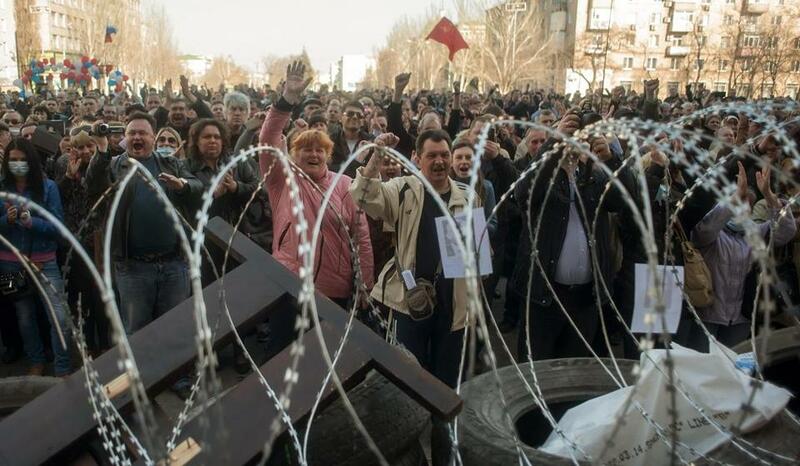 Pro-Russian protesters shouted slogans at a barricade near the occupied administration building in Donetsk, Ukraine. DONETSK, Ukraine — Ukrainian authorities moved to quell pro-Moscow uprisings along the Russian border with mixed results Tuesday, retaking one occupied regional headquarters and watching protesters consolidate their hold on another. In a third city, Luhansk, Ukraine’s Security Service said separatists armed with explosives were holding 60 people hostage inside the agency’s local headquarters. Ukrainian and US officials have accused Moscow of fomenting the unrest as a pretext for another Russian military incursion like the takeover of Crimea last month. Up to 40,000 Russian troops are massed along the Ukrainian border, according to NATO. All the cities affected by the uprisings are in Ukraine’s industrial heartland in the east, which has a large population of ethnic Russians and where hostility is strong toward the government that took power in February after the ouster of Kremlin-friendly President Viktor Yanukovych. European Union envoy Catherine Ashton said she will meet with US, Russian, and Ukrainian foreign ministers next week to discuss the situation — the first four-way meeting since the crisis erupted. In Washington, Secretary of State John Kerry threatened tougher economic sanctions against Moscow. ‘‘What we see from Russia is an illegal and illegitimate effort to destabilize a sovereign state and create a contrived crisis with paid operatives across an international boundary,’’ Kerry told the Senate Foreign Relations Committee. Earlier Tuesday, Ukrainian authorities battled pro-Russian protesters and regained control over a government building in Kharkiv, the country’s second-largest city. 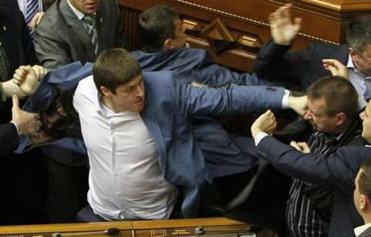 Acting President Oleksandr Turchynov told Parliament that several police were hurt during the clashes with what he termed separatists. In Donetsk, a city 155 miles south of Kharkiv, protesters dug in for their third day at the 11-story regional administration headquarters they captured on Sunday and began forming their own parallel government. Serhiy Taruta, the governor of Donetsk, scoffed at the shifting events in his city. There was little sign Tuesday afternoon that Ukrainian government forces had immediate plans to clear the administration building. The city has been the site of weekly rallies, but Sunday saw an escalation of that strategy when masked men carrying batons burst through police lines to take over the building. By Tuesday, 6-foot walls of car tires wrapped in razor wire had been erected against any attempt to storm the place. On Monday, the demonstrators declared the creation of a sovereign Donetsk Republic and called for a referendum on the issue to be held no later than May 11. Despite claims by the demonstrators to represent the entire Donetsk, a region of more than 4 million people, rallies outside the administration building since the weekend have drawn crowds of about a few thousand. While none of the leading figures in the self-proclaimed Donetsk Republic movement have said they want the region to join Russia, they have declined to rule out the option. Their initial priority, they say, is to secure autonomy, after which the population will be asked whether it wishes to become part of Russia. White House spokesman Jay Carney said this week there was strong evidence some pro-Russian protesters in eastern Ukraine were hired and were not local residents. People in the corridors of the Donetsk building — many of them wearing masks and carrying sticks — invariably identified themselves as being from Ukraine when questioned. Similarly, representatives of the Donetsk Republic movement dismissed claims of Russian support, saying volunteers had arrived from all across the Donetsk region.